We’ve been busy working on a big project for a client who has commissioned our animation studio to create an educational and environmental animation for young people. Names can’t be mentioned yet but the animation is due to be released in September 2014. So far the project has been a blast and we’re loving working with this client to produce various animation concepts. As part of the project we presented a few concepts and some animation examples to a group of young people and gathered feedback. Now it’s our job to take our client’s messages and turn it into an animation with all those qualities! Have a look below for photos of our animation production works so far. Animation concepts printed out and ready to present to the audience focus group. Animation storyboard drafts printed out for a team meeting and song writing session. Our music producer, Ben Haynes, coming up with animation song ideas on his guitar. 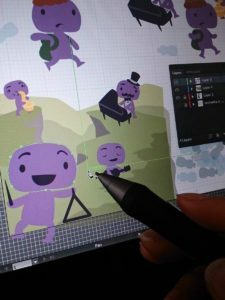 Creating character designs and concept art in Adobe Illustrator with a Wacom Cintiq. Rendered animation style concept illustrations to accompany the storyboards we sent to our client for review.